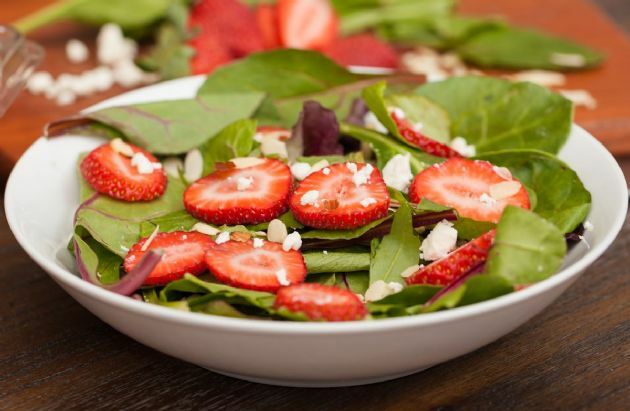 Instead of slicing strawberries for the salad, quarter them. Quartered strawberries are easier to pick up with a fork. When you include caloric, high-flavor ingredients such as nuts or cheese in a salad, spread the flavor around by finely chopping, crumbling, or slicing those ingredients. A little will truly go a long way. Top this or any salad with three ounces of your favorite lean protein to give it some staying power. From The SparkPeople Cookbook: Love Your Food, Lose The Weight. Place the almonds in a dry skillet or saute pan. Cook over low heat, shaking the pan the entire time until the almonds are toasting. The almonds are done when you start to smell a "nutty" scent. Prepare the dressing by placing the vinegar, mustard, and honey in a mixing bowl. Slowly whisk in the oil. Place the spinach in a large bowl. Add the strawberries, almonds, and dressing. Toss to coat. Top with goat cheese. If desired, season with a pinch of salt and pepper.